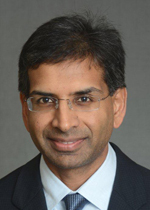 Dr. Menon received his Doctor of Medicine degree from the Boston University School of Medicine in 1993. He completed his internship and residency in internal medicine at Boston City Hospital (Boston University), and is board certified in internal medicine. He also served as a primary care provider at the Dorchester House Community Health Center in Boston from 1993 through 1996. After practicing in Atlanta, Georgia, for one year, he joined Chapel Medical Group in 1997. His clinical interests include preventive medicine, nutrition and weight management, complementary/alternative/integrative medicine, and medical education. He was one of the first 100 physicians in the U.S. and one of the first physicians in Connecticut to complete the Fellowship in Integrative Medicine through the University of Arizona, Tucson. The Fellowship in Integrative Medicine, a 2 year course under the direction of Andrew Weil, MD, is the most comprehensive course available to physicians and health care providers to learn about integrative medicine and complementary and alternative therapies. It involves study in the following areas: nutrition, the art and philosophy of medicine, medicine and culture, mind-body interactions, botanicals, physical activity, spirituality, traditional Chinese medicine, homeopathy, manual medicine, and energy medicine. In addition, Dr. Menon serves as an Assistant Clinical Professor of Medicine at the Yale School of Medicine. He instructs Yale medical students in ambulatory medicine, interviewing skills, and complementary and alternative medicine. On a personal note, Dr. Menon enjoys spending time with his three children. His hobbies and interests include tennis (he was a former NCAA Division I college tennis player), jazz and world music, comparative religion and spirituality, and travel.